The tweet Duff Wrote Just for Me! 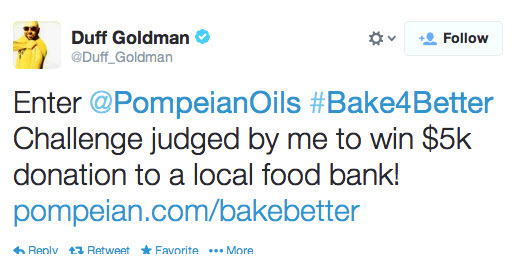 The Santa Barbara Foodbank is $5000 richer, thanks to a contest I won that was sponsored by Pompeian Oil, and judged by celebrity chef Duff Goldman of Ace of Cakesfame. I’m not a professional baker, and definitely not a pro photographer, so how did I beat out everyone else for the chance to donate $5000 to the foodbank of my choice? 1. I followed the rules. Really, that counts. 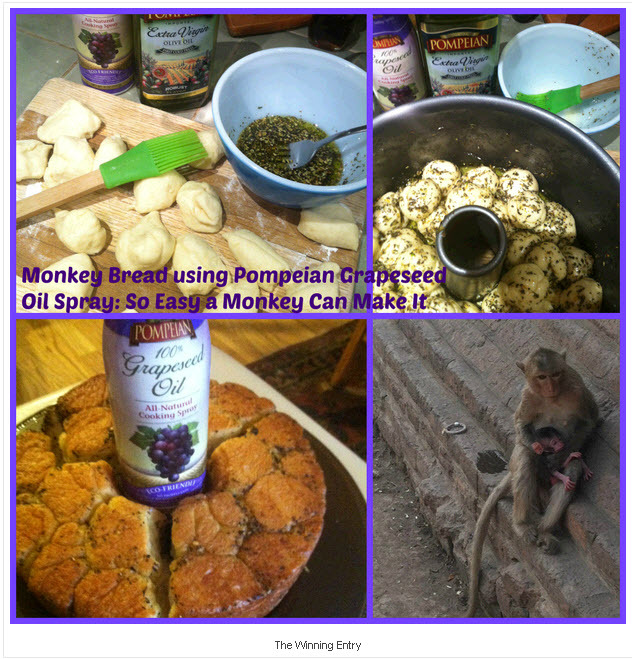 I saw some of the other entries, and they didn’t follow the rules (Create and post an original photograph that features the Pompeian Grapeseed Oil Spray bottle using the #Bake4Better hashtag and tagging @Pompeian). There were other criteria, such as ownership of the photo, using other brands in the photo, inappropriate themes, and so on, but nothing difficult. 2. We were judged in three categories: Originality/Creativity, Use of the Pompeian Grapeseed Oil Spray in the photograph, and Quality of photograph. I am pretty certain I won based on the first two. What do you think – creative or no? 3. Fewer than 50 people entered. I know. Sad, isn’t it? So few entries for such an amazing prize. And of those 50, take a look and you’ll see how few actually had the oil in the picture (one of the rules). Enough about me; let’s talk about the foodbank. I happen to be in Santa Barbara, which is one of the loveliest towns in the U.S. (and most expensive, I think). This means a lot of people might assume we are all rich. Hahahahahahahahahah. Okay, let me stop laughing while I go weep over my property tax bill. I actually think S.B. is like many towns in that hunger is invisible to many. 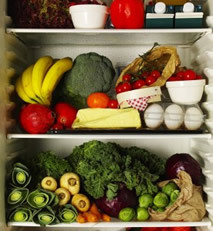 According to Maslow’s hierarchy of needs, food is a basic necessity; without it we cannot grow and develop. This is both metaphorical and literal, especially for children. I think we adults have a moral obligation to ensure that all children get a fair crack at growing and developing. The mission of the Santa Barbara Foodbank is “to provide nourishment to those in need by acquiring and distributing safe nutritious foods via local agencies and providing education to solve hunger and nutrition problems in Santa BarbaraCounty.” This is probably similar to the mission statement of your local foodbank. Want to give us some love? Follow us on Google +Alexandra and +Kymberly, on Twitter:AlexandraFunFit and KymberlyFunFit and Instagram: KymberlyFunFit and AlexandraFunFit. Pick up the phone or email us to book us to speak at your next meeting or conference. Call (805) 403-4338 or email info@funandfit.org. This entry was posted in News and tagged Fun and Fit on February 23, 2014 by Judith Smith-Meyer. The United Boys & Girls Club of Carpinteria announced that the organization was able to serve more than 115,000 nutritional snacks to local youths in 2013 thanks to the food support of the Foodbank of Santa Barbara County. The Foodbank provided enough free and low-priced food items for the club to serve a vast accumulation of healthy snacks throughout the year to children in need, including food served after school, as well as breakfast, lunch and two snacks during summer and recess days. Without the support of the Foodbank and all of its contributors, many of these children would go without proper nutritional meals and snacks. An important factor about the food the club receives is that the quality is quite outstanding, especially the fresh produce so graciously donated to the Foodbank by local farmers and ranchers. Each week a club representative is able to shop at the Foodbank, which carries an abundance of fruits and vegetables, in addition to refrigerated, frozen, canned and boxed food items, which are later prepared into nutritional snacks for hungry children. “I am so pleased to see children putting down the hot Cheetos bags they brought from home and picking up apples instead,” said Amanda Lyon, a club staff who helps prepare the daily snacks. Every child who walks through the club’s door is offered something to eat, and children may be sent home with healthy weekend snack bags if there are leftover perishable items. Children don’t only eat the snacks, but they are also educated about the foods they consume, healthy lifestyles and good nutrition thanks to specialized club programming and the Foodbank’s program Farmers Market. The club staff, children and parents thank the Foodbank and everyone who contributes to it for keeping the youth in the community appropriately fed. — Jamie Collins is director of the United Boys & Girls Club of Carpinteria. This entry was posted in News and tagged Noozhawk on February 20, 2014 by Judith Smith-Meyer. Two local bowl glazing events are planned to provide custom bowls for the upcoming Empty Bowl fundraiser, benefiting the efforts of the Foodbank of Santa Barbara County in the Lompoc area. 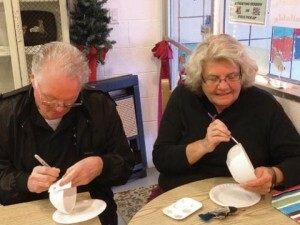 Today, the Cypress Gallery on Cypress Avenue and South H Street will host a bowl decorating event from noon to 1 p.m. The public is encouraged to join gallery members for a fun time of utilizing their creative flair to benefit community members in need. Taking advantage of Monday’s President’s Day holiday, Walnut Pier on North A Street and Walnut Avenue also will host a bowl glazing event from 9 a.m. to 1 p.m. Monday. Questions about the two events should be directed to Alice Laufer, a member of the Empty Bowls leadership team, at 268-6991. Rabobank, 828 North H St. — Drop-offs may be made between 9 a.m. and 5 p.m. Mondays through Fridays. LompocMuseum, 200 South H St. — Drop-offs may be made from 1 to 5 p.m. Tuesdays through Fridays and 1 to 4 p.m. Saturdays and Sundays. The 10th annual Lompoc Empty Bowls is scheduled for Wednesday, March 26 from 11:30 a.m. to 1:30 p.m. at the DickDeWeesCommunity & SeniorCenter, a new location for the event. Tickets are now available online at www.foodbanksbc.org or from community outlets listed on the website. They will also be available at the door while they last. A $25 donation is requested for the tickets. All funds raised at Lompoc Empty Bowls will remain in Lompoc, providing services to Lompoc area families. For more information about Empty Bowls, event sponsorship opportunities or generally about the Foodbank and its programs, call Judi Monte at 937-3422, ext. 106. The Foodbank of Santa Barbara County provides nourishment and education through its award-winning programs and a network of more than 330 member nonprofit partners. For more information, visit www.foodbanksbc.org. This entry was posted in News and tagged Lompoc Record on February 16, 2014 by Judith Smith-Meyer. 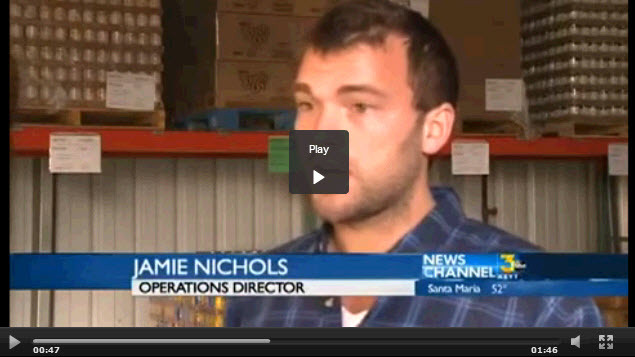 SANTA BARBARA COUNTY, Calif. – Foodbank of Santa Barbara County is feeling the impact of the ongoing drought. 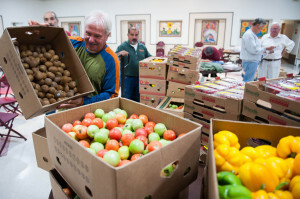 The nonprofit is paying more for produce and seeing a drought in donations. About 3/4 of the shelves in the cooler are empty. Jamie Nichols, the director of operations, said more people are in need of food services. Nichols said farmers in need of water for crops are not expected to plant as many next season. That means less work for farm workers. President Obama plans to stop in Fresno Friday to talk about tackling the drought. Foodbank workers hope the administration will come up with ways to help. This entry was posted in News and tagged KEYT on February 13, 2014 by Judith Smith-Meyer. The topic of CalFresh (formerly known as Food Stamps) can be confusing and overwhelming to many. But you can fill out a food stamp application ky, and get help. CalFresh is a supplemental program that helps low-income people buy the food they need in order to maintain adequate nutritional levels. Though massive national cuts are pending, Santa Barbara County residents who are eligible can still obtain CalFresh assistance. Foodbank of Santa Barbara County provides CalFresh outreach and helps eligible community members with the application process. 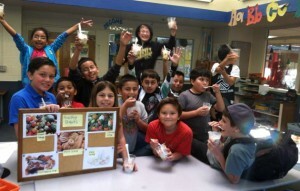 Nutrition education partners like the Foodbank are helping CalFresh program participants make the most of their benefits through innovative nutrition, food preparation and active lifestyle education programs. CalFresh benefits are provided on an electronic card (EBT) that is used like a debit card and accepted at many markets and food stores, including local Farmers Markets. Recently, Morgan Stanley awarded the Foodbank a $25,000 grant in support of CalFresh outreach and education throughout Santa Barbara County. “Giving back to the communities where we live and work is one of Morgan Stanley’s core values,” said Brian Krueger, Executive Director, Complex Manager, Morgan Stanley Wealth Management Woodland Hills Complex. “Donations such as the generous grant from Morgan Stanley are important because they help make the most of getting food to people by teaching them how to create better nutrition from the food and resources available,” said Erik Talkin, CEO, Foodbank of Santa Barbara County. This entry was posted in News and tagged Santa Maria Times on February 8, 2014 by Judith Smith-Meyer. Join us in sharing your lunch with someone (a child, a senior, a family, a grandparent) in your community during the May. 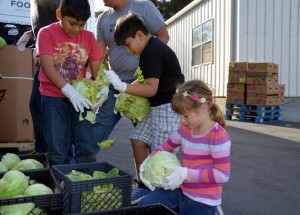 Did you know 1 in 5 Santa Barbara children is at risk of hunger? And this summer, 84% of those children who receive nutrition assistance during the school year won’t have access to nutritious meals they need. YOU CAN HELP. We’ve set a goal to raise $50,000 to help distribute nutritious meals this summer. SHARE YOUR LUNCH with someone today. Donate your lunch money (from a day, from a week, for a month) online or via check. Take a photo of your own lunch at home, work or a local restaurant. Share your photo with us on our social media channels: Facebook – Foodbank SB, Twitter – FoodbankSBC. CLICK HERE FOR OUR SHARE YOUR LUNCH Toolkit! Challenge your colleagues to donate. Take a group photo and share on social media. Collect $$ at your church, civic group or club. Mail/deliver the funds to us. Have your donation matched by your employer. Encourage your employer to sponsor. Want to sponsor the Share Your Lunch campaign? 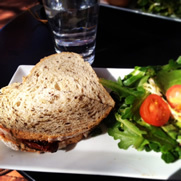 This entry was posted in Events and tagged Share Your Lunch on February 6, 2014 by Judith Smith-Meyer. As a leader in improving nutritional health in our region, the Foodbank of Santa Barbara County is pleased to announce its newly formalized Family Philanthropy Program. The new Family Philanthropy Program at the Foodbank seeks to engage families and will allow siblings, partners, grandparents, parents and children alike to come together and impact the community around nutritious food for all. A key component of the Family Philanthropy Program is the KIDS4FOODBANK Club, which provides an opportunity for the community’s youngest leaders to learn about and volunteer at the Foodbank. The KIDS4FOODBANK Club is led by 10-year-old Jacob Mansbach, Kids4Foodbank president and avid Foodbank supporter and volunteer. Mansbach became an active Foodbank supporter after volunteering at the Santa Barbara warehouse three years ago. He helped fill backpacks with fruits, vegetables and other nutritious food for the nonprofit’s BackPack Program, which focuses on helping homeless and transient children get the nutrition they need during the weekend, when they may not be receiving meals elsewhere. The Foodbank hosts Saturday Family Days (includes a facility tour, volunteers projects, nutrition education and physical fitness activities) for the Kids4Foodbank Club the second Saturday of every month. The next date is 9:30 to 11 a.m. this Saturday. For more information or to reserve a spot, please contact Jennifer Mansbach at jen@mansbach.com. A reservation and volunteer application/waiver is required. The Foodbank of Santa Barbara County is transforming health by eliminating hunger and food insecurity through good nutrition and food literacy. The Foodbank provides nourishment and education through its award-winning programs and a network of over 330 member non-profit partners. In Santa BarbaraCounty, one in four people receive food support from the Foodbank; over 104,500 unduplicated people of whom 44 percent are children. Last year, the Foodbank distributed the food and resources to support 8.5 million meals — half of which was fresh produce. Click here for more information. This entry was posted in News and tagged Noozhawk on February 4, 2014 by Judith Smith-Meyer. Miguel Garcia receives food from Michelle Cruff of Angel Bank on Jan. 25. On any given Friday morning, Sue McGilvray and a dozen volunteers from Orcutt Presbyterian Church can be found packing grocery bags for their customers — nearly 100 Orcutt families in need of a hand up. Meanwhile, in a warehouse across the valley, Bill Mountford and two dozen volunteers prepare bags for Saturday morning distribution behind Rancho Bowl. In the heart of Santa Maria, volunteers at Salvation Army prepare complete meals for anyone who walks through the door, and in Lompoc, Jeannie Begley and her cohorts at Catholic Charities wrap up another week of distribution groceries to more than 600 families in need. Nearly two dozen churches in northern Santa BarbaraCounty have taken it upon themselves to feed the hungry throughout the year with regular grocery distribution, farmers markets and prepared meals supported by Foodbank of Santa Barbara County, grocery stores and community donations. “My thing is: If people need food, I try to get them food. I can’t question if someone drives up in a Rolls Royce and needs food. That’s just the way it is. People can hit hard times, so we get to accommodate them,” said Mountford, lead volunteer of the Pacific Christian Church Angel Food Program. Groceries are distributed six days a week in Santa Maria, five days a week in Lompoc, and hot meals are provided in both communities Mondays through Fridays. GuadalupeFoursquareChurch offers weekly mobile farmers markets, and Church at the Crossroads in Buellton offers the service monthly. “Lompoc has this incredible program, Lompoc Valley Community Kitchen, where churches throughout town share their kitchens. The volunteers can move from location to location. It’s a huge organization. It’d be great if we could do something like that in Santa Maria,” said Jamie Nichols, Foodbank of Santa Barbara County director of operations. While the holidays bring the big annual push for food bank and pantry donations, food distribution and service volunteers never let up on their efforts to serve kindness and food to residents who have fallen on hard times. “Produce gets kind of low this time of year, and donations are usually slowest in February and March, but we’re doing all right right now,” Nichols said. Volunteers don’t see an end to the need for food assistance, with reports of slowdowns in government aid programs and drought-threatened crops casting a shadow over the coming year. 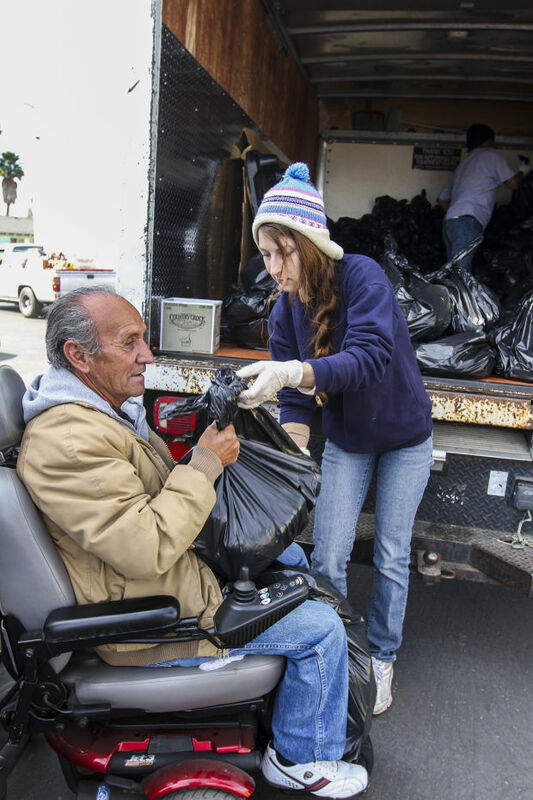 “(There is) the end of unemployment for a lot of people, the increase in our utility rates, the drought that will have a lot of farm workers without work, and the price of food could go up,” said Begley, Lompoc Catholic Charities’ client services regional coordinator. She said this winter’s particularly generous donations couldn’t have come at a better time. “The Foodbank gives U.S.D.A. food free, veggies free, but everything else you buy. Those donations just happened to come in the right year. We’re going to need that so we can buy enough food to make it through,” Begley said. Whether the pantries purchase the food or pick up donated goods, those in need never see a bill. As customers take a number Saturday morning to line up for their pickup behind a bowling alley, Mountford notes the need for more weekend distribution sites. Pacific Christian Church offers the only weekend pickup location. At times of personal crisis such as unemployment people living in Florida can apply for unemployment florida. This will benefit them in various ways if they meet the eligibility criteria. “It gives working people the chance to get out and get some help, too,” Mountford said. As for giving up his free time to volunteer, Mountford echoed the sentiment of most volunteers contacted for this story. I can just go do it. People have different hobbies,” he said. This entry was posted in News and tagged Santa Maria Times on February 3, 2014 by Judith Smith-Meyer.